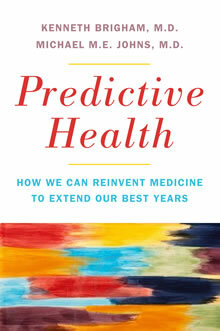 "Predictive Health: How We Can Reinvent Medicine to Extend Our Best Years" (Basic Books, October, 2012), is the work of Kenneth Brigham and Michael M. E. Johns. Listen to the authors discuss the book and read excerpts in this Emory Book Report. Listen to Michael Johns and Kenneth Brigham discuss their new book, "Predictive Health: How We Can Reinvent Medicine to Extend Our Best Years." A new book by two Emory University physician/administrators proposes a new approach to health care: focusing on health first instead of disease. Rather than targeting the occurrence of disease and then administering treatment, the predictive health leaders suggest that the detection of biomarkers — signals of disease risk — can promote early intervention. "Predictive Health: How We Can Reinvent Medicine to Extend Our Best Years" (Basic Books, October, 2012), is the work of Kenneth Brigham and Michael M. E. Johns. Brigham is Emory professor of medicine, emeritus, and former director of Emory's Predictive Health Institute. Johns is Emory professor, former executive vice president for health affairs, and former university chancellor. Together, the two developed the Emory University Predictive Health Initiative and the Center for Health Discovery and Well Being at Emory, with strategic support from the University as well as colleagues at Georgia Institute of Technology. Health prediction requires understanding the genetic, metabolic, and contributive causes of illness and disease. Brigham and Johns want to harness the formidable power of medicine and technology — including genome-sequencing, protein-cataloging, massive data-sorting — as tools for health assessment, diagnosis, and intervention. The ultimate goal is to guide people to the improvement and maintenance of their health. Physicians who practice predictive health would assemble a health portrait by running sophisticated tests on an infant at birth. Potential risk factors for diseases, such as type II diabetes or a genetic propensity for obesity, would become evident long before they are problematic, and physicians could initiate personalized strategies for treatment. Brigham points out that "Our approach involves more than curing disease or making an early diagnosis. We see it as important to develop a mindset in which to see health as defined positively. We look at disease risk but more importantly at what a person can do to live a healthy, fulfilling life. We look at body fat and what is in a person's blood, yes, but we also look at how you live, where you live, who you live with, and how you react to stress, to determine a healthy lifestyle for an individual." Brigham and Johns also seek to redefine a good death. "Most people want to grow, age and die with dignity," Johns points out: "No one wants a protracted, unpleasant, painful death. These new principles may help people live longer in wellness and die without extreme and prolonged illness." Brigham agrees: "Our society spends an inordinate amount of money and emotional effort in denying that death is inevitable. If someone has a terminal condition — not curable — we try to postpone death. We expend time, money, and energy giving false hope. Our idea is not to go for heroic measures when we know it's not going to change the outcome." Predictive health is even more important given scarce resources, shortages of health providers, growing costs and an aging population. Johns states, "Our health care costs have skyrocketed, and we need a plan for getting them under control. These new ideas will help redirect resources and reduce costs. If people are well longer, they will not need as much expensive health care." Brigham adds, "We currently pay for disease care rather than health care. To contain costs, we must decrease the demand. A focus on health is the only long-term solution. Given the economic crisis, we must focus on efficiency. We cannot afford not to."